To get a grasp of where you are, Cancun is located on the edge of Mexico that wraps around the Gulf of Mexico and separates it from the Caribbean Sea. As you can see here, Cancun is fairly close to Cuba and really not that far from Florida. 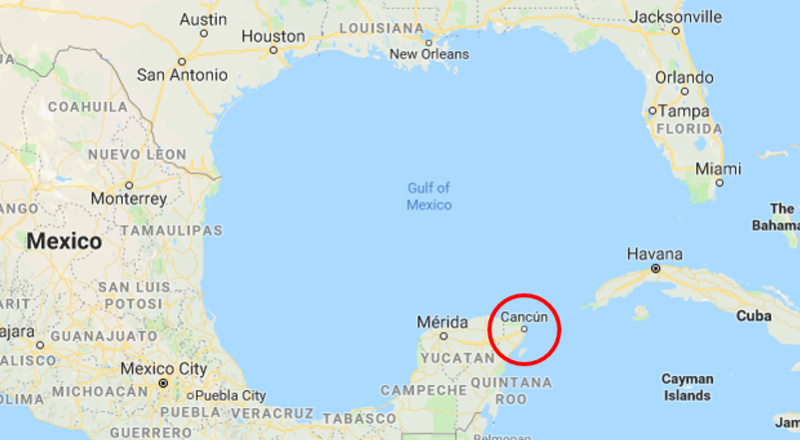 The greater Cancun area includes the Zona Hotelera (translation not needed) in the north, which is a strip of land separated from the mainland by a lagoon and packed with hotel after hotel in a similar fashion to Miami Beach. In this thread, when people refer to Cancun, they are usually referring to this area. A ferry ride away is the island of Isla Mujeres. Below Cancun on the map, you'll see the airport in red. The area south of Cancun is known as Riviera Maya which contains many resort areas including Playa del Carmen, and within Playa is Mayakoba. A ferry ride away is the island of Cozumel. Cancun hotels and Kosher restaurants map. Mera Lounge - Accessible with Priority Pass except between 12:30 and 16:30 (not nice lounge). Airport security / food restrictions covered in the Kosher Food section below. Wifi at Cancun Airport Business Center - Network: businesst3 Password: businesst3. Some people rent cars, others seem strongly averse to car rental due to many reports of being pulled over for speeding. Those reports often conclude with being able to give the cop ~$20 to avoid the ticket. If you plan on only staying in Zona Hotelera, you don't need to rent a car. You can stay at the top of the strip (Hyatt Ziva, IC, Aloft) and be within walking distance to Chabad and the restaurants, or you can stay further down the strip and take the convenient bus up and down for MEX12 (currently about $0.65USD); drivers happily make change, at least from small peso bills. Reports that they will also take a $1 bill but won't give change. Taxis outside the strip to Walmart or Costco shouldn't be too expensive either. To get to/from the airport, you can book a private shuttle (see below). If you plan on going outside the Zone to activities with a tour, you can usually pay extra for transportation, but if you plan on going out on your own schedule, you'll want to rent a car. If you plan on staying in Playa del Carmen, you'll likely want to rent a car, although it's possible to avoid it by taking an airport shuttle (see below) there and staying at the Grand Hyatt which is within walking distance of Chabad and the restaurants or at the Fairmont/Andaz and having Chabad deliver food to you. Same advice for activities above applies here - go with a tour and pay for transportation or go out on your own and just rent a car. Canada Transfers: $55 RT (if you choose to pay in CAD, currently you'll only pay about $50). USA Transfers: $55 RT for 3 people; $65 RT for 7 people. Happy Shuttle: $53 RT. No DDF reviews, but Google reviews are positive. Car rentals can be relatively cheap, and many hotels have free parking, but liability insurance is mandatory (you should be able to use for CC for collision insurance), and they won't allow you to use your car insurance from back home, so that can jack up the price. Make sure to have your reservation quote with you as some reported that the rental agents tried raising the price in person. And remember, keep to the speed limit. Westin Lagunamar - 20K/25K SPG (low season/high season) for a studio room. Studios can be booked with points online but one-bedroom suites require PUTPAC. Seems you can get 1BR suite for 1.5K more SPG per night. Some have been able to get complimentary upgrade from studio to 1BR without difficulty, but YMMV. There is no recorded history of anyone getting upgrade from 1BR to 2BR villa, as a 2BR is really a 1BR connected to a studio (essentially 2 paying rooms, so hotel won't do that). The 1BR suite is ~1,000 SF, so almost twice the size of the studio, and has expanded kitchen, with full-size fridge, full-size cook-top, microwave and dishwasher (but no oven). The 1BR suites have W/D (not sure about the studios). shiframeir - Best value, huge resort with lots of heated pools during winter and big slide, lots to do and good kids club. Hyatt Zilara - 25K Hyatt (all inclusive, adults only). Lots of rave reviews in the thread. 5 minute walk to Chabad and Dag Dag restaurant, separate water playground by kids club zone, next to ferry to Isla Mujeres, has water sports and dolphins on premises. Ritz Carlton - Tier 3, can use free night certs. JW Marriott - 45K Marriott. Great service, beautiful hotel, pool and beach. Intercontinental Presidente - 30K IHG. Derived from shiframeir - Great location for Shabbos, close to Chabad, nice big lobby to chill in the afternoon, lots of first floor rooms (no steps needed), decent pools (one adults only, one family, felt a little cool might not be heated), really great service. Aloft - 4K SPG. shiframeir - pretty lousy though very cheap and close to Chabad and Dag Dag, pool on roof is small and not heated, rooms are interesting but a bit dingy, bathroom uses glass sliding door without much sound protection zow - I'm not as negative about it as shiframeir. It is very cheap, but a great location. Not a luxurious place to hangout, but if you're going to be out and about, it's good value. [/i] Cheapest option for 1 night. Grand Hyatt - 20K Hyatt. Fairmont - Covered in Dan's TR (top of wiki). Rosewood - Non-points hotel considered to be the most luxurious in the area. InterContinental Presidente - 40K IHG. WARNING: Lots of food gets confiscated at airport security. Meat, random cheeses (some make it through, some don't) and un-packaged foods are not allowed. Snacks are okay. You will be asked to push a button, if the light turns red, they will go through all your bags for food; if it turns green, you can officially go free, but there are enough reports of being pulled to the side anyway and searched for food - hypothesized due to "looking Jewish", but plenty who look Jewish have reported getting green and going free as well. Chabad Kosher Cancun - fleishig takeout food with a very timely delivery option run by the Rabbi Mendel Druk and family. They also offer Shabbos meals on premises for $25 a meal ($15 kids) or delivered to your hotel. There is supposedly a sit-down restaurant coming soon. Reports are that the food is really good and restaurant quality and comes with very timely delivery. Detailed review here. There is an additional menu for Yeshiva week here. Falafel stand - located right outside Chabad and under their supervision. Garden Beach - milchig, breakfast section of Red Heifer open 8am-2pm. Dag Dag - homey, milchig and fish restaurant, covered in Dan's TR, zow - fish and chips were very good, as was the pizza, but also has mixed reviews in taste, long wait times and randomly being closed. The owner is a little eccentric, but nice, and if you order in advance, it's not too bad. Was/Is (?) under supervision of Rabbi Mendel Druk of Chabad of Cancun. Costco - cheese (large cream cheese box "Raskas Queso Crema" is Cholov Stam, Natural and Kosher is Cholov Yisroe), hummus, salmon spread, lox, PB and J, bread (Star K), milk (both shelf stable "La La" brand, as well as Kirkland brand - not sure which Hechscher) and mantequilla/butter (OU). Sam's Club - breads ("New York Deli and Bagel") and other essentials. Walmart - cereal, milk, eggs, avocados, drinks and many other things you need like pans and spatulas. Chedraui Selecto - near Chabad, has frozen bagels, cereals, tuna, one Kosher meat product and many other products. Minimart in Westin Lagunamar - bunch of imported Kosher items (La LA milk is under KA Kosher), but sometimes runs out. They have beer at about $1/bottle. Erupea - has 1 or 2 Kosher wines. Soriana - many Kosher items. Random stores - many have OU snacks from America. Chabad of Playa del Carmen - fleishig food delivery run by Rabbi Mendel Goldberg, a DDF member, that's really good, restaurant quality. Contact them for an updated menu with more choices than listed on website. They also host Shabbos meals for free, but ask for donations (they say it costs them $40/$20 adult/kid per meal). Alternate Chabad of Playa - (AKA bootleg, yellow flag version...) is run by Rabbi Chaim Brod and has an in-house restaurant located at Avenida 20, entre Calle 6B y Calle 8. They have a Hebrew website. Hotel 770 - fleishig restaurant, grocery and hotel under Rabbi Chaim Brod's supervision. Calle 10 Norte Bis. Menfis - Israeli restaurant, review, under Rabbi Chaim Brod's supervision. Calle 14 Norte, Entre 5a y 10. Mas Pan - dairy restaurant serving pizza, sandwiches and paninis, under supervision. Jerusalem - Nice fleshig place with good food and quick service, under Chabad of Cozumel - R. David Caplin and R. Shalom Peleg (yellow flag). Calle 10 North and Av. and General Rafeal, second floor. Cafe Rimon - milchig restaurant also under Chabad of Cozumel (yellow flag). Calle 4 North and Av. and General Rafeal. Chocolatte - milchig cafe under . Falafel Sombrero - falafel place under Chabad of Cozumel (yellow flag). Cafe Maya - [Currently closed for renovations] milchig restaurant, under some Chabad (R Druk of Cancun vouches apparently), cash only, but bring pesos as it's much cheaper here than USD. Food is excellent and prices here are very reasonable, so long as you pay in pesos. Family of 5 can feast on paninis, pasta and pizza, with soft drinks/coffees, easily under $50USD. Pictures of store and food (scroll down). Directions: two blocks straight ahead (5 min walk) when you exit the ferry terminal (Calle Bravo? ), then make a left when you hit the end (on Av Guerrero) go another block, and it's a few stores down the next block on the left side. Reviews on yelp, TripAdvisor. Via email to @Yehuda, Rabbi Eidlitz from KosherQuest recommended Rabbi Mendel Druk of Chabad of Cancun. Chabad - has Minyanim during busy seasons, but check with them to confirm (they are really great, give a nice donation!). They also offer meals, see Kosher section. Kosher Luxus / Red Heifer - offers meals, see Kosher section, and may have Minyanim, check with them. Westin Lagunamar - check with the Chabad Rabbi whether there has been a Minyan recently, but enough Jews have timeshares at Lagunamar and come for winter break that they seem to have a Minyan during winter break outside by the BBQs (Fuego) all the way on the south of the hotel (by the last pool to the right coming out of lobby towards fountains). Ferry to Isla Mujeres - small island off the coast near Cancun, rent a golf cart to go around the island - can get carts by walking left or right for a few minutes after you exit the port and get a decent rate; shiframeir got 2 fast carts for afternoon for $70 total going left (right has mixed reviews on speed), get some Kosher food, visit Garaffon Reef Park, Turtle Farm, Playa Norte, Dolphin Discovery. Xplor - 4 activity course / theme park of swimming and kayaking in a cave, jeeping in the jungle and ziplining into water; highly recommend, night version is cheaper and offers ziplining through ring of fire. Xcaret - theme park, one reviewer spoke to people that went who said it was waste of time & very costly. Boka del Puma - theme park, cheaper option to Xplor. Selvatica - ziplining and biking, Alma's LDS tour includes this and Mayan ruins. Emotions Jungle Night - another theme park. Jungle Tour - motor boat tour through lagoon to an area where you snorkel, recommended. Mayan Ruins - Chichen Itza - most famous, Tulum, Coba - only one you can still climb. Cenotes - natural pools/caves to go swimming in; Ik Kil - near Chichen Itza, Sistema dos Ojos. BOB - Breathing Observation Bubble, underwater scuba-like contraption, highly recommended. Ferry to Cozumel - larger island off the coast of Playa del Carmen, with an Intercontinental and Kosher food. La Isla Mall - has an aquarium, dolphin show and Haagen Dazs. Mayakoba Lagoon - boat tour and biking, hotels in Mayakoba provide this. Swim with Whale Sharks - June, July and August, one company with high review is Whale Shark Daddy. 5th Avenue in Playa del Carmen - shopping street. Scuba Diving - one company with a high review is Squalodivers. Hummer Tours - fun way to see more of Mexico. Isla Contoy - small island north of Isla Mujeres. Secret Beach/Pool - found by Suave, location here. I just got back, take a look at my TR. Im happy to answer any questions. Yep just read it, thanks for writing it up. Programs: spg gold. nothing else. sigh. Can i get Pampers, wipes, baby jars? pampers and wipes should be easy, not sure about kosher baby jars. I just got back from Cancun, I went out for Shabbat meals to the new Ember restaurant (kashrus KMD Mexico). Right across the Fiesta Americana. Friday night - Dips, fish, soup and short ribs with grilled vegetables for the main. Food was delicious. Shabbat day - (No fish) Dips, Eggs with quinoa, Chicken with potatoes, chulent was delicious with lots of meat. There was a nice variety of wines to choose from. Sunday night we ordered dinner to our room. Main dish 'Ember Fillet' was very good. What is the weather there in the summer months ? i sit worth going there in the summer weather wise ? Isn't that where the red haifer is? They are next to each other? Got it. Now I know where it is. Thanks. Stay in the hotel zone and it's safe.